The First South African Ring Record! Even at the age of 69, SAFRING is still young in comparison to some of the worlds oldest ringing/banding schemes (British Trust for Ornithology >100 years (1909), Bird Banding Laboratory - Patuxent Wildlife Research Center >90 years (1923), Australian Bird and Bat Banding Scheme >60 years (1953), and EURING > 50 years (1963); which comprises the oldest active ringing schemes (i.e. the Hungarian Ornithological Centre est. 1908)). As a result of these schemes earlier efforts, we have many retrap/recovery records dating back to the early 1900s. 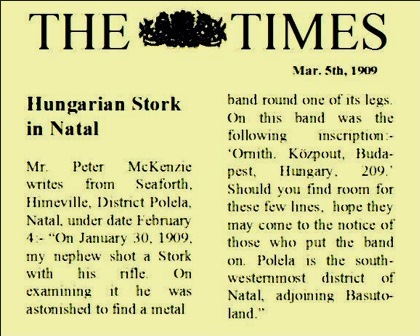 The earliest record in our system dates back to 1909 where a White Stork ring was recovered after being shot in KwaZulu-Natal. It had a Hungarian ring 209 which had been put on the stork chick in Romania in the previous year. This was the first scientific evidence of a migrant crossing the equator. Following this recovery there were many more White Stork ring sightings over the following years (Ring: VIB00198 in 1911 from Denmark, Ring: 287 in 1910 from Hungary, Ring: 2199 in 1910 from Hungary, Ring: 2298 in 1909 from Romania). The first sighting of a bird ringed in Britain was a swallow seen in 1911 (Ring: B830). To read more on this sighting please Click Here. Bird ringing in South Africa started in 1948 when the Southern African Ornithological Society (SAOS) initiated a bird ringing scheme under the leadership of Dr EH Ashton (please "Click Here" to read his account). 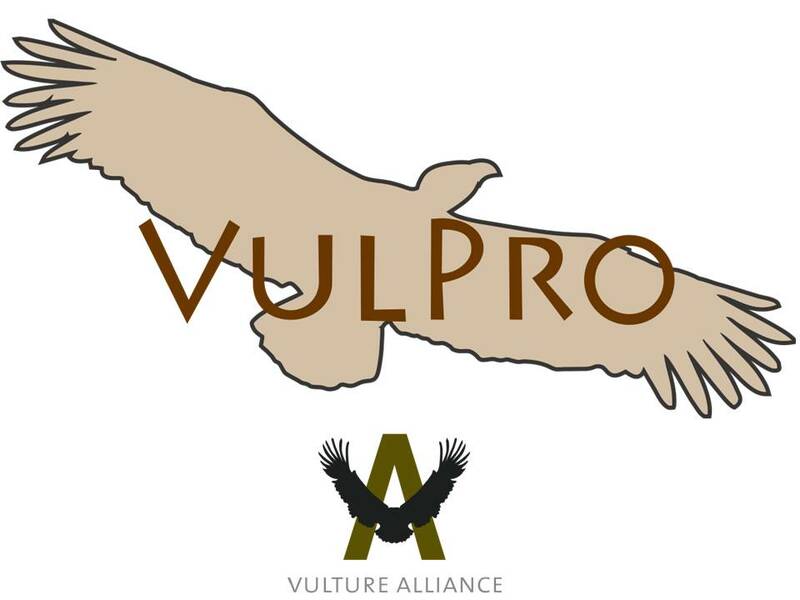 The first birds to be ringed were 31 Cape Vultures Gyps coprotheres, ringed on 1 August 1948 at Kranzberg by a team of birders and mountaineers. A year later one of these, ring C00086 was found near Bulawayo, Zimbabwe, the first recovery of a southern African bird ring. Bird ringing was initially organized in 1948 by the Southern African Ornithological Society, SAOS (Read the meeting minutes). Dr Hugh Ashton from the Witwaterstrand Bird Club played a big part in this development and later coordinated the scheme until 1 July 1956 (Read Dr Hugh Ashtons Account). During this time he authored the first six ringing reports (Read Here; First, Second, Third, Forth, Fifth, Sixth). 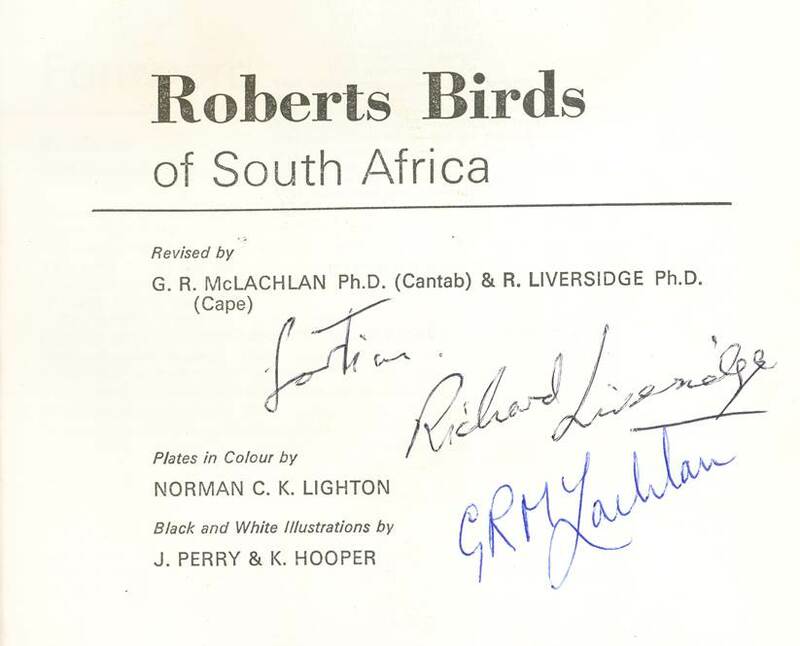 After the first South African Bird Ringing Scheme Coordinator, Dr Hugh Ashton, retired his position on July 1st, 1956, Dr Geoffrey Roy McLachlan took over the reins. After an initial trail period, where the treasurer, Mr Heard, and Dr McLachlan worked through correspondence, the whole scheme was relocated to Port Elizabeth. 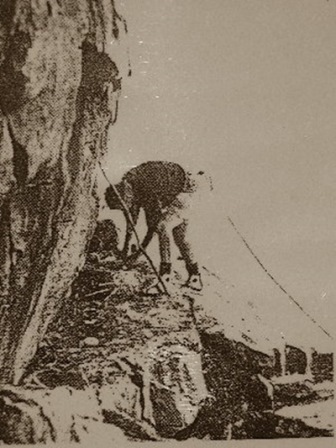 Dr McLachlan had his work cut out for him, as a number of problems arose with the growing ringing dataset. Some of these problems included; data storage, data submissions and costs of ringing (Read Dr GR McLachlan's Account). One of the drastic moves he made to improve data submissions, was to drive across the country visiting all ringing hot spots to help ringers in person. During his time as coordinator he authored eight ringing reports (Read Here; seventh, eighth, ninth, tenth, eleventh, twelfth, thirteenth), as well as many papers, Roberts' Birds of South Africa (2nd, 3rd and 4th) and a ten year summary. Dr GR McLachlan left the Ringing Unit at the end of 1966 to persue other projects and passed away at age 81 on January 17th 2005 (obituary). Photo taken at the 1964 Pan-African Ornithological Congress. 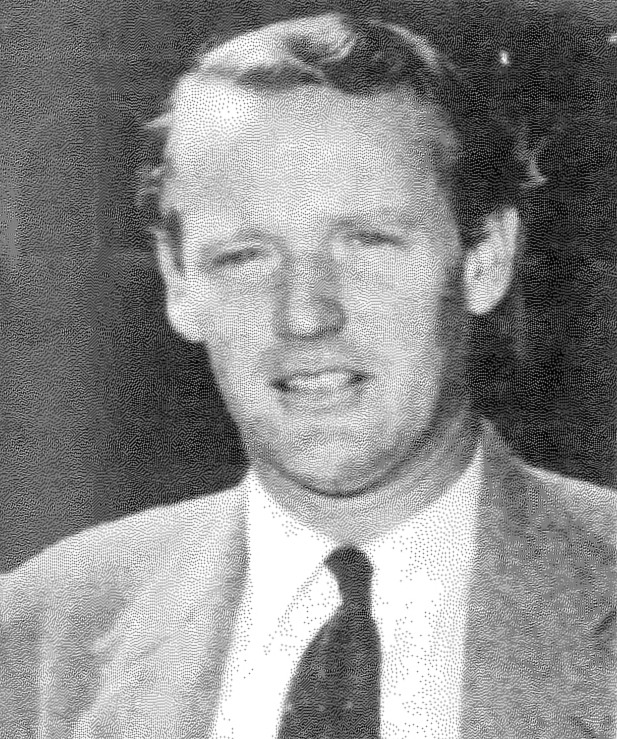 Dr McLachlan, Dr Niven and Mr JP Niven were the Organising Committee for the First Pan African Congress held in Livingstone, Zambia, from 15–19 July 1957. After Dr Geoffrey Roy McLachlan moved from Museum in Port Elizabeth in 1966 (read Dr McLachlans note), it was decided that the Ringing Scheme be handed over to a larger organisation with proper funding and staff. As a result the entire scheme was moved to the FitzPatrick Unit in Cape Town. The scheme was still administered by the South African Ornithological Society (SAOS - Now BirdLife South Africa) until 1972 when the first full time coordinator was employed, Dr Clive Elliott. With this new leadership the Scheme was renamed the National Unit for Bird-Ringing Administration (NUBRA). This new unit struggled initially as the ringing data had been neglected over the previous five years. It soon made some great steps forward and one of the great improvements Clive made was the creation of "SAFRING News". In the first editorial entitled "Overcoming Isolation" Clive details the need for communication between ringers (to share knowledge, techniques, downfalls and interesting observations) and thus emphasising the need for such a magazine (written for the ringers, by the ringers). During his time at NUBRA Clive authored (along with Mike Jarvis) three Annual Reports (the fourteenth, fifteenth and sixteenth). Although he only stayed for three years he was able to achieve a lot (to read a short account of his years click here). 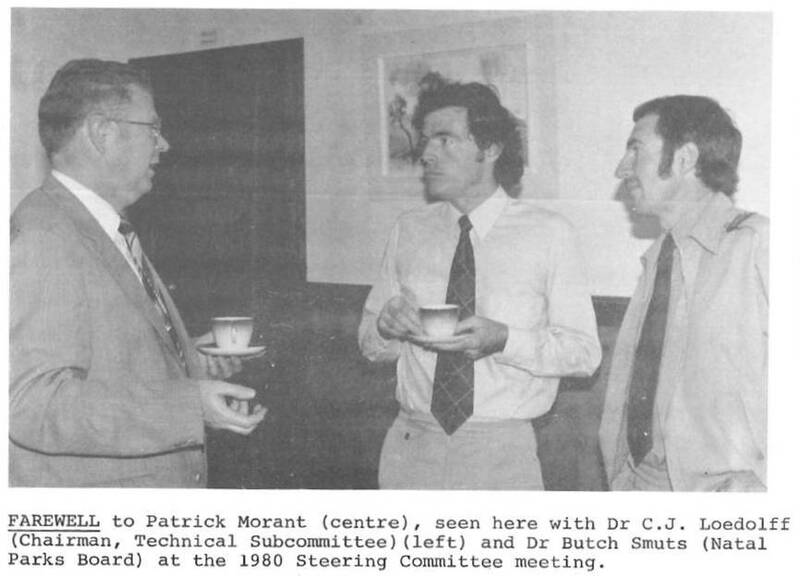 With Sir Clive Elliott leaving the NUBRA (National Unit for Bird-Ringing Administration) in 1974 to work for the Food and Agriculture Organization of the United Nations, the Post for Bird Ringing Coordinator was once again opened. As a result Dr Carl J. Vernon took the post in 1975. At the time the Ringing Scheme was still hosted by the Percy FitzPatrick Institute of African Ornithology, University of Cape Town. One of the big projects Carl took over from Clive was the computerisation of ringing data onto Hollerith cards (punch cards). 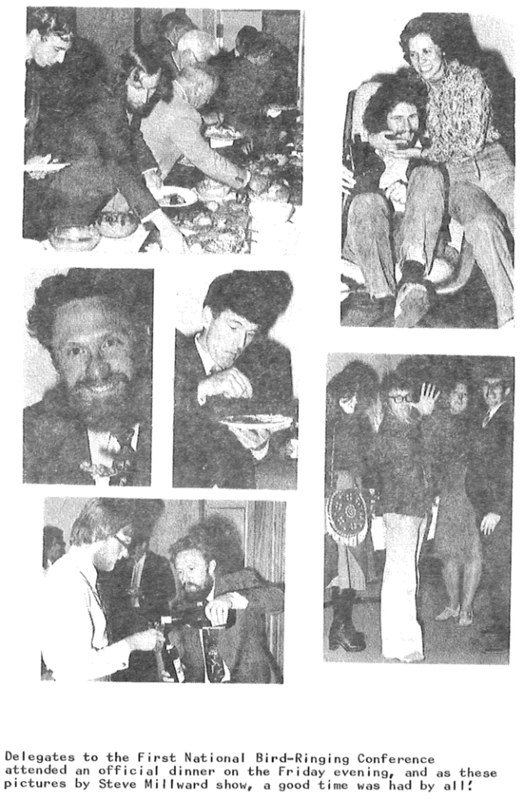 Close friend Dr Steven Piper (founder of the Steven Piper SAFRING Trust) assisted in this, although all did not go to plan (Read further details in Carls' Obituary for Steven). Carl has a noted interest in shorebirds which can be seen in the topics chosen for the SAFRING News Articles during his term (Read SAFRING News). Additionally Carl put a lot of effort in promoting colour ringing as a means of improving the resighting counts (Read his first Editorial), and authored three Annual Reports (the seventeenth, eighteenth and nineteenth). 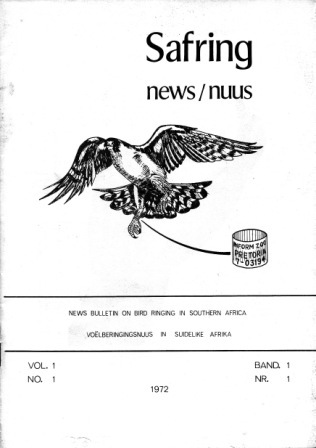 During his term at the ringing unit, the First National Ringing Conference was held in Gauteng. Carl was then offered the post as ornithologist at the East London Museum and left in 1976. After Carl Vernon took up the post as ornithologist at the East London Museum, NUBRA (National Unit for Bird-Ringing Administration), now known as SAFRING (South African Bird Ringing Unit), stood leaderless once again. With this opening Patrick Morant (an MSc Student) was found to coordinate the Unit (with help from John Ledger). One of the first problems Patrick identified was the lack of communication between the amateurs and the professional ornithologists. As a result, one of his goals was to bridge this gap in what he called "Let's communicate '78'" (Read more in his editorial entitled, Communication). Continuing with this mantra he encouraged amateur ringers to send in their ideas and observations for the SAFRING News letter, in his Editorial - Write It Up! In addition to this sharing of knowledge through newsletters he also discussed the requirements around the sharing of ringing data and potential use thereof. 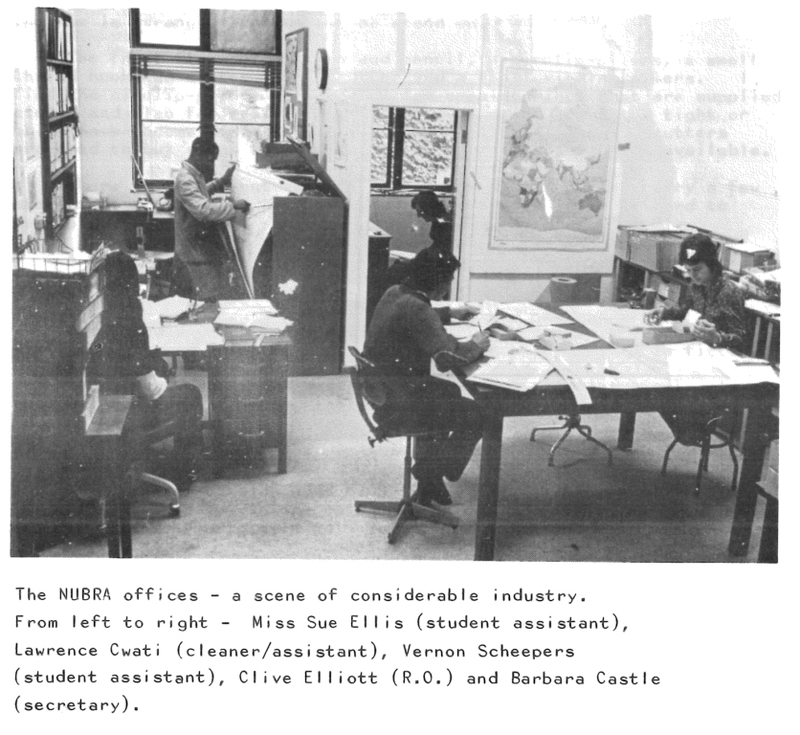 This was not a permanent post (still housed at the Percy FitzPatrick Institute of African Ornithology) and Patrick left in 1981 to pursue other projects in Estuarine Ecology. During his stay Patrick authored three Annual Reports (the twentieth, twenty-first and twenty-second). After Patrick Morant left in 1981, the position of SAFRING coordinator was filled by Terry Oatley, this time as a permanent post. With the assistance of Mirella Rammesmayer, Terry set out to; “make SAFRING a top flight service organisation and to give every encouragement and assistance possible to ringers, be they amateurs or professionals” – quote from his first SAFRING News editorial. Over the next 17 years he did just this with the number of active ringers increasing each year. Prior to SAFRING, Terry spent 22 years working at the Natal Parks Board (Terry can be seen sitting in a game vehicle in the photos attached). 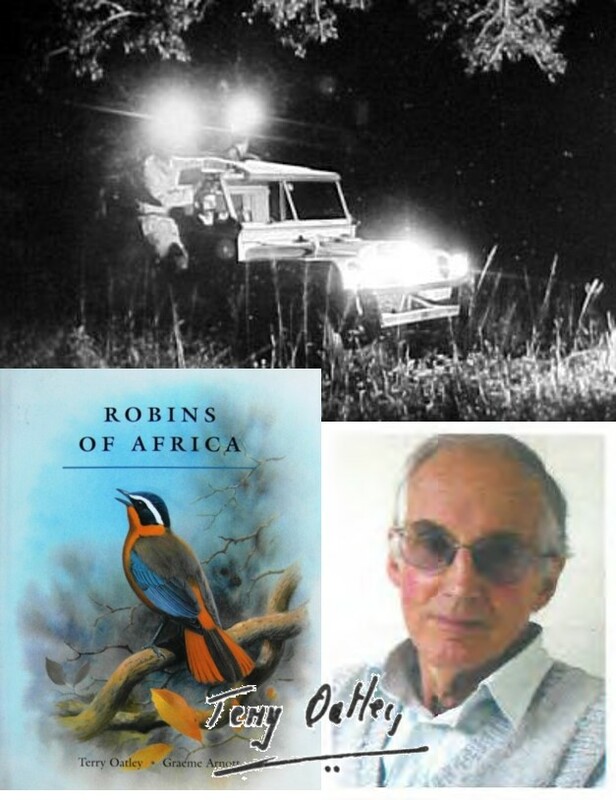 He was passionate about studying robins (a passion seeded in child hood – Read his daughters (Jenny Freemans') account in Ostrich), and published a book – Robins of Africa - and many papers on this group. In 1993, while he was at SAFRING, Terry was awarded his PhD by Wits for his work on the Ground Woodpecker. It would be impossible to capture all that Terry did over his 17 years as SAFRING coordinator in this short web article. To read more, please go through all his editorials from SAFRING News and end off with his light hearted final editorial where he comments on his highs and lows as coordinator. Following his retirement, in 1998 he was awarded the Gill Memorial Medal in recognition of his outstanding contribution to ornithology in the southern African region. To read more on SAFRINGs history please Click Here.